I have to disagree about the use of low-fat dairy. Dairy fat doesn’t cause obesity or cardiovascular disease risk, and actually might be protective against the latter, not to mention important for fertility and other aspects of health. I see low-fat dairy as a processed, detrimental food. I also eat butter by the chunk and use a lot of cream! I agree with you, Debs! Full fat dairy is part of a healthful, whole food centered lifestyle. The target audience of my post is those who are trying to actively lose weight (PSMF), body builders, those who have to watch their carbs AND calories. What works for one person doesn’t work for everyone. Excellent recipe! Thank you so much! 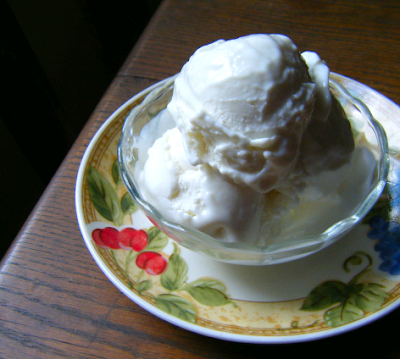 I made this today, vanilla flavored, and it tastes just like vanilla frozen yogurt. I didn’t have any coconut milk, so i used heavy cream instead, and i also threw in a litte zanthan gum to see if it had any effect after i put it in the freezer. For sweetener, i used sweetzfree, and a dash of maltitol syrup, just a bit, to see if it made a difference in consistency. the flavor is excellent, a bit salty tasting though as knudsen cottage cheese is all i was able to get. thanks again, your recipes are brilliant. i loved the mock payday candy bars. This was so rich and creamy right out of the food processor, it was too tempting to eat it as a pudding. My mix never made it to the ice cream maker. But I’m okay with that! What a great idea to pack in the protein! I made the chocolate version last night with somewhat disastrous results. I used chcolate raspberry SweetLeaf brand stevia – which packs a very unpleasant aftertaste. I confess that I ate it for dinner! Anonymous – Glad you had success putting your own spin on the ice cream! Allie – Your tiramisu version is so creative. Sounds delicious! I’ll have to try that. have you ever experimented with making either kind using only fruit and/or honey instead of stevia/erythritol/xylitol to sweeten? i was thinking maybe using mashed bananas or dates(soaked first so they are softer) would work since they are both very sweet, and then picking other flavors that complement them…date hazelnut coffee flavor might be good, or pina colada(using a little coconut milk along with crushed pineapple and a little mashed banana). debs, how can you call low-fat dairy a processed food? do you know what skim milk is…its just milk that literally has the cream skimmed off the top. buy a gallon of real unhomogenized milk and let it sit, then get a spoon and scoop off the top layer…that isnt processing. now commercially available fat free dairy products that have a bunch of disgusting crap added back into them to get people to think it tastes like full fat dairy is completely different…that stuff is garbage. Anonymous – Hi! Great questions. I use an ice cream maker for the cottage cheese version because now I HAVE an ice cream maker. 🙂 Both versions are yummy, but the difference in texture from using an ice cream machine puts the cottage cheese version over the top! Also, the ricotta ice cream mix is much less runny than the cottage cheese mix. 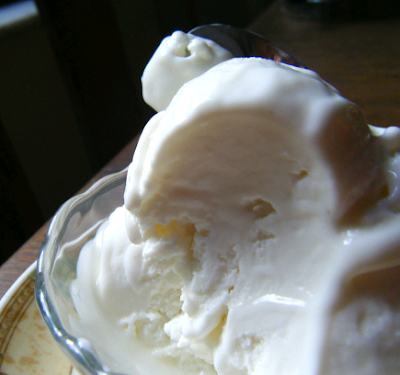 The latter is a nice pourable consistency—perfect for the ice cream maker! As for how well they keep, both versions are similar in that they harden up into a solid block within 12 hours of freezing. 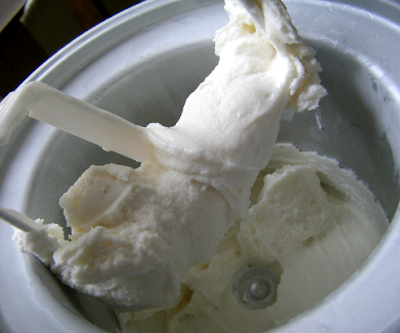 If you want sugar-free ice cream to remain soft and scoopable, you must add vegetable glycerin and erythritol to depress the freezing point of the ice cream mix. 1 tablespoon of vegetable glycerine is enough for high fat recipes. Low fat recipes like this cottage cheese ice cream will unfortunately never be soft enough to scoop because of the water content. I just nuke this ice cream in the microwave for 10-15 seconds before eating, so it melts to the point where I can dig my spoon in. i am still trying to figure out where i can get vegetable glycerine locally first. i have no idea what to look for, the only glycerine i ever bought was for soap making and i got it at the drug store. anyhoo, we’re going camping in two weeks. i am going to process the recipe, throw it in the mini fridge, and we’re going to put it in the ice cream ball. should be a hoot, a workout and a treat lol. i’ll let you know how it turns out, it shoud be fine. i can’t wait to try it! what are your thoughts on adding liquids? i had wondered at adding torani or davinchi syrups for flavor enhancement, but being inexperienced at this, i have no clue how much the structure of the recipe can be changed. ideas? Hi Playdoh – Enjoy your camping trip! I would not advise adding any more liquid to this recipe. Added liquid = an icier, less creamy ice cream! The higher the water content, the more frozen yogurt-like it will taste. This recipe is best right out of the ice cream maker for that reason–less time for ice crystals to form! 1. Could you substitute nonfat cc? 2. Could you add some milk (or soymilk) to make it stretch a little farther (less calories)? 3. Could you do it w/yogurt instead of cc? 4. Wouldn’t guar gum work just as well as glycerin? Mekkie – the first time I did this I used fat free cottage cheese! I didn’t look closely enough at the ingredients label, though–it actually contained “artificial flavor” and some other undesirable additives. If you can find an additive-free version of ff cottage cheese, or if you don’t care, go for it. I’m a diet addict! And I absolutely love making fatty things “almost no calorie” (my favorite right now is nachos/tacos). I’ve had trouble with ice cream though. I made some with fat free yogurt and fruit and it was fine right out of the ice cream maker, but after a day in the freezer and a little defrosting, it was…gummy and separated into chunks and water. Ewwww…any suggestions? Could you also use liquor to keep it from freezing so hard? Jacob, I edited the post to show that adding vodka would work well too. I hadn’t discovered that little trick back when I posted this. Thank you for the reminder and I hope you like the ice cream! Saying that this can be prepared in a food processor is a little misleading. I just threw out a whole batch of this cause it was grainy and I thought my cheese had gone off, when actually it was just under processed. A magic bullet must be a remarkable device to get those lumps of cheese into a smooth slurry, but I had to use my double bladed, Wave Action, Ice crushing blender to get this to a smooth consistency. I suggest recommending folks start this project with a true blender to avoid wasteful disappointments like mine. BTW, the flavor was really nice. Hi, just discovered your blog (looks fantastic!) and tried my hand at the lemon ice cream variation. I thought I had a good idea in making a simple “sugar” syrup by melting the erythritol with the lemon–thought it would be smoother but what a disaster. It recrystalized so quickly and I ended up with very crunchy ice cream (probably worse than if I hadn’t put the lemon and erythritol to the heat at all). SO…my first question is, should the erythritol for this recipe be powdered (doesn’t say so here)? And/Or is there a way to make a simple “sugar” syrup using erythritol or a safe substitute like xylitol? Clearly science trumped my efforts as erythritol doesn’t behave like sugar. Thanks! Anon – I have had a good experience by simple pureeing the erythritol with the cottage cheese for a couple of minutes. I did not notice the erythritol recrystallizing, so I am not sure what happened! I will have to give this recipe a try again when I can have access to my ice cream maker at home. Thanks for sharing your experience! I used a magic bullet for this recipe and its simply amazing!!! BTW, smooth as silk and could double as a pudding perhaps…? The absolute easiet way to make a quick icecream treat! I wanted vanilla, so subbed the lemon for vanilla and I'm in heaven!! Thankyou for this amazing recipe! I have a Cuisinart 1 1/2 qt. ice cream maker. Do you know what the smallest amount you can make is? Can you make this 2 srving recipe in there or won't it mix well? OK made another variation…this one was the best yet! Viagra Online used to make excellent recipes like this one. Ah! A little vodka! Genius! My ice cream always turns to rock too, because I just use stevia.. I will have to try that! Lauren, I've become obsessed with your blog. You are helping me become a celebrity chef in my own home. 🙂 I tried this cottage cheese ice cream (a chocolate with chocolate flakes version) a week or so ago, and everyone loved it. P.P.S. I talk too much! I made the chocolate version of this yesterday, and it was too salty from the cottage cheese. Is there a brand that has less salt? What I had was Food Lion's store brand, because that is the only 1% I could find. Diana, thank you for your feedback! The Friendship Brand No Salt Cottage Cheese works well here. Will update the recipe to show that. Diana – I think I used friendship brand cottage cheese. Hope that helps! Hi Lauren, Do you think you used the Friendship brand No Salt cottage cheese? I made the chocolate almond recipe tonight, and it was much too salty from the cottage cheese. The texture was great, though, and I’m going to keep experimenting. Love your blog! Susan, thanks for the kind words! Friendship Brand no salt cottage cheese was the brand I used. Will update the post with that brand recommendation. I think you’ll enjoy my latest recipe (Shamrock Shake) as its very ice cream like. I’m sure it would freeze nicely in an ice cream maker. You could use part skin ricotta to reduce the calories. Hope that helps! Thanks, Lauren. I tracked down some no salt cottage cheese at Safeway: 1% No Salt Lucerne. Made the recipe again last night with the NS cottage cheese, egg whites & cocoa. Much better without the salt and great texture, but I’m noticing a chalky flavor from the cottage cheese. I wonder if certain flavorings like maybe coconut or key lime would mask that. I also thought of adding some cream instead of the egg whites or coconut milk, but that adds a lot of calories and fat. Have you tried other variations? The ricotta cheese blends up to a finer, less chalky consistency than the cottage cheese. The egg yolks make the texture creamier with their emulsifying properties, just like they do in a traditional custard. This recipe is very versatile! You can make it chocolate flavored by adding a tablespoon of cocoa powder and a splash of vanilla extract. To make the texture more like that of ice cream, use the second method of preparation. I think both you and your husband will enjoy it! Yum!! Followed the directions the first time I made it (used ricotta), but the second time I used 1/2 cup liquid egg whites instead of 1/4. It was even better than the first! I put the mixture in my Vitamix and it got silky smooth, then put in my ice cream machine This is really delicious! Next time, I'm going to follow the lemon recipe, but will use key lime juice instead. Looking forward to trying that. I only have packets of aspartame available (not the healthiest, I know) right now – 4 Tbsp of that sounds like a lot, and I keep thinking it’s a more concentrated sweetener… what would you do if you had to use aspartame (Equal)? Thanks! Hi, Vanessa! I’ve never worked with aspartame. When substituting any sweetener for use in my recipes I recommend tasting the dough/mixture as you go along and adjusting the sweetness as necessary. With uncooked recipes this technique works particularly well since the sweetness won’t be altered by heat. If I were you, I’d try combining sweeteners to get the best taste if you’re able to get your hands on a second sweetener. That seems to yield the best results in sugar-free recipes. Hope that helps! The chocolate is really good! I think next time I’ll leave out the almond flavoring. I used cottage cheese and the texture was great. 🙂 I look forward to trying the lemon! I really love your recipes!. Can you make a sugar free sugar cone recipe and a sugar free waffle cone recipe. Also naturally sugar free butterscotch chips recipe and sugar free/low sugar low carb candied yams with marshmallows recipe. You have so many great ideas!. so glad you posted this recipe! i made your chocolate almond ice cream with some variations: I nixed the almond extract, added a tablespoon of bourbon, added about half a tablespoon gelatin (i heard somewhere that it may help with preventing ice crystallization), and topped it with a dash of cardamom. tastewise, i thought it was great! i dislike cottage cheese and can reaffirm that this recipe masks its taste. Lauren (nice name! ), I’m glad you were able to put your own twist on the recipe and come out with a tasty treat. Your tweaks sound great! Just found your website tonight (from a user comment at CCKatie). Ive been making ice cream from cottage cheese for a long time. Or 1/2 cup cc, 1/2 cup greek yogurt, 1 cup almond milk, plus flavorings (sich as few tablespoons dry pudding mix, or add 1/2 cup pumpkin). 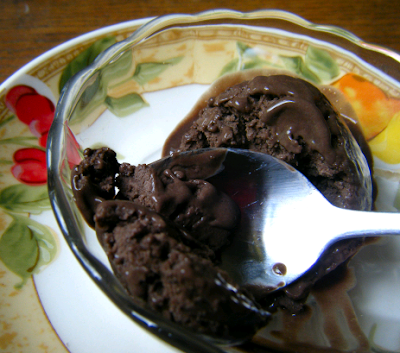 I dont have ice cream maker, but stirring it every 30 minutes in freezer works ok.
I’d really like to try your version. If i used pasteurized egg whites in carton, i have no concerns EXCEPT would that ingredient work with the freeze and stir method i mentioned??? I’m concerned some are ice cream maker only ingredients because of desired function??? Thanks! So happy to find your blog! Shawna, thanks for visiting my site. 🙂 The ice cream maker ensures that lower fat recipes come out less icy. If you use the freeze and stir method, you might get large ice crystals. How did it turn out for you? Would like to use maple syrup to sweeten – how much would you recommend using ? I assume additional liquid will not affect success of recipe ? Dibster, try 3 Tablespoons, then add more from there. The additional liquid should help to keep the ice cream soft since it’s maple syrup is pure sugar, and sugar softens ice cream. Hope that helps! Portugal na versÃ£o “agarra que Ã© cro”onosim, mas nÃ£o de colarinho branco, pois esses o poder nem quer fingir que agarra. No mais concordo plenamente com o texto. Boa semana com tudo de bom. I should add that we have an — I think it should still work — such that when we get the podcasts going, it will be possible to subscribe via iTunes and then just download the podcasts to your iPod, along with Ira Glass and Melvyn Bragg, and listen to them wherever you like. Thank you so much for sharing your recipe. I made the lemon version and it tastes so good. This is great for me and when I tested my blood sugar two hours after eating it, my level was below 110! I used low fat Ricotta cheese from Kroger (only 55mg of sodium – Kroger brand) and did not taste a hint of salt.